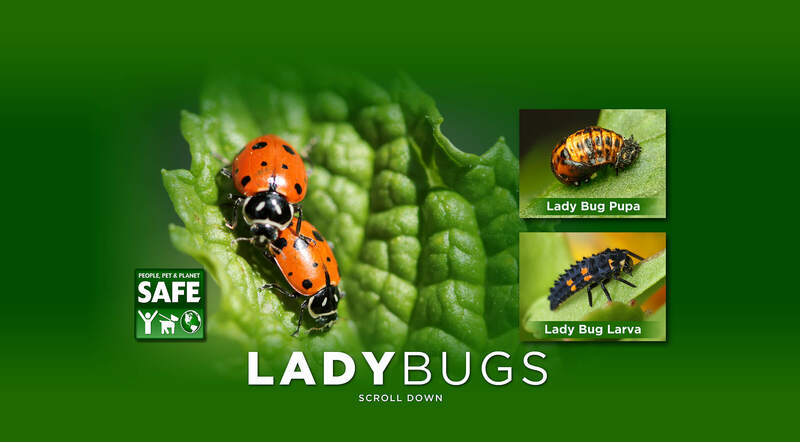 Lady Bugs - Organic Control, Inc.
QUITE POSSIBLY THE WORLD’S FAVORITE BUG! Use: Ladybugs prefer to eat aphids and will devour up to 50 a day, but they will also attack scale, mealy bugs, boil worms, leafhopper, and corn ear worm. They dine only on insects and do not harm vegetation in any way. Release: Ladybugs should always be released after sundown since they only fly in the daytime. During the night, they will search the area for food and stay as long as there is food for them to eat. The more they eat the more eggs they lay and the more insect eating larvae you will have. It is best if the area has been recently watered. Ladybugs tend to crawl up and toward light. So release them in small groups at the base of plants and shrubs that have aphids or other insects, and in the lower part of trees. Recommendations: Ladybugs may be kept in the refrigerator after they are received (35-50 degrees F.) and released as needed. Ladybugs received March through May should not be stored more than 2 to 3 days since their body fat has been depleted. From June on, they may be stored 2 to 3 months. Life Cycle: Ladybugs mate in the spring and lay yellow eggs in clusters of 10 to 50 on the underside of leaves. About five days later the larvae emerge and will eat about 400 aphids during their 2.5 week cycle. The larvae look like tiny black caterpillars with orange spots but do not eat vegetation. The larvae then pupate and emerge from their cocoon as adults after about a week. They begin feeding on aphids, other insects, and pollen to build up their body fat. In the summer and fall the Ladybugs migrate into the mountains and during the winter they lie dormant under the snow. In the early spring they fly back down to the lowlands to resume searching for food in earnest. They begin mating, lay eggs, and die. Now that you’ve learned more about lady bugs, it’s time to add these wonderful insects to your garden. Like all beneficial insects, you can be sure that they’ll dine only on your garden’s pests and won’t harm the good bugs or your plants. Use our dealer locator to find a store near you! NOTE: Keep in mind that it’s normal for there to be several dead lady bugs in the container, especially those received from March through May. These bugs have reached the end of their life cycle. We always include many extra bugs to compensate for this.